local milk | Ag Moos "Growing the Land"
Author’s Note: Amazing how even more true this piece from 2016 rings today in 2018. This “Growing the Land” column was originally published two years ago in the July 20, 2016 edition of the Register-Star in New York’s Hudson Valley. Indeed, it is still timely today, two years later, as summer memories are still grand and dairy farm milk price margins are still poor — and as a society we continue to incrementally lose the soul of our food, which we may not even fully appreciate or realize is happening. The fresh flavors of summer are in — sweet corn, tomatoes and, of course, ice cream. In fact, July is National Ice Cream Month, and it is certainly hot enough for some extra frozen goodness. Summer foods bring back summer childhood memories: Celebrating first pickings with a dinner of simply sweet corn and sliced tomatoes. Or an ear of sweet corn for breakfast — no sugar required. And then there were those summer evenings when Dad would get in just before dark, singing: “I scream, you scream, we all scream for ice cream!” Off we’d go to the nearby ice cream shop where the number of flavors made our heads spin and the homemade goodness left us smiling. So much goes into producing these simple pleasures we may take for granted. I recently ran into a cousin of mine attending an event I was covering for the ag papers at a dairy farm in southern York County, Pa., that had been in two branches of our family four generations earlier. He had grown up in Baltimore and now lives on a nearby small farmette that had stayed in our great uncle’s family, renting a little crop ground to a neighbor. I had brought my then 94-year-old grandmother to the farmer-meeting. My cousin Tom decided to come over also — curious to see the place as a modern dairy farm that had some historic significance to our family. I was there just doing my job. Before the farm tour, the event gave farmer-attendees a run-down of the latest business improvement resources for managing below-cost milk prices and updates on various regulations. Unlike my cousin, I had spent my high school and college years working for nearby dairy farms — milking cows, feeding and caring for livestock, running equipment; beginning later a career as an ag and markets reporter. I was accustomed to the farm life my cousin had not experienced. Having a deep appreciation for local farmland around his current home, he attended this first-ever farmer meeting and found it to be an eye-opener. He was also surprised by the number of young people at the meeting, whereas I had many times witnessed the passion of next generation farmers — their love for bringing new life into the world and their dedication to nurturing life, which in turn produces for the rest of us a bountiful harvest. He just shook his head in wonder. Why do they do it? Why do they carry-on this time-honored tradition of feeding the world? Why do they do the hard work for an often thankless society? And how do they keep pushing forward through daily chores and challenges when the prices they receive for their products are often below what it costs them to produce it? This is certainly the case for dairy farmers over the past 12 to 18 months. (2018 update: that situation is going on 4 years now). Their farm-gate milk price has dropped 40 percent below 2014 levels and is roughly where it was 40 year years ago, while the input costs continually increase. There are roughly 2 million farms of all kinds and sizes in the U.S., but less than 40,000 of these farms are dairy farms. The dairy farm sector may be small in number, but they represent the largest economic driver in dairy states like Pennsylvania and New York, where they account for half the cash farm receipts in the state, and one job is created in the greater community for every 9 dairy cows on nearby farms. Nearly half of those jobs are related to dairy farming and the service and supply sector, and the other half related to dairy processing and other downstream aspects of the dairy economy. 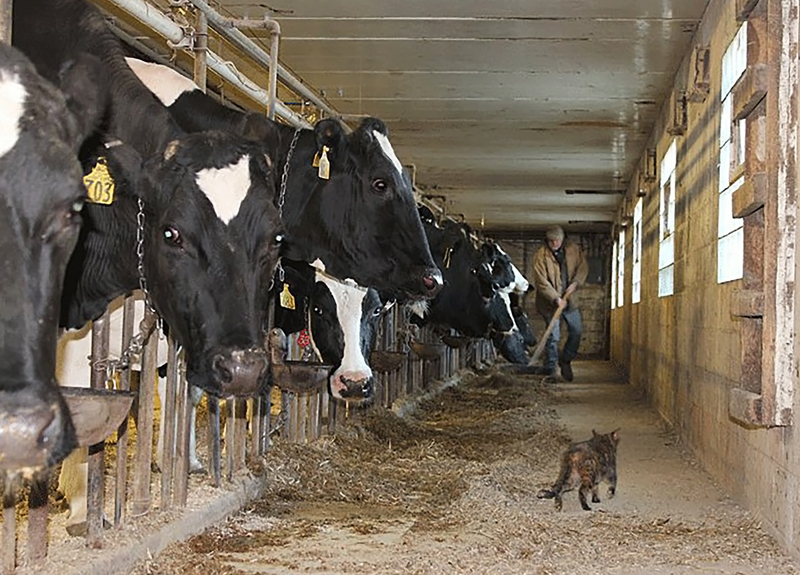 Dairy farms are often a linchpin for the infrastructure relied upon by all farms in a region. In these tough economic times, dairy farmers are exhausting credit lines, spending their savings, borrowing on the equity of their land and looking for other work to add to their already busy days — just to pay the bills for the goods and services that are associated with feeding and caring for the cows, servicing and keeping up the equipment, and other aspects of economic revenue generated throughout the community by the production of milk. Families who have expanded their dairy operations in the past five to seven years — when industry and government asked them to produce MORE milk to fuel what was a rapidly growing yogurt industry in the Northeast at that time — now find their investments at risk because of the low prices paid for their milk today. A reported oversupply of milk, globally, has depressed the commodity markets on which the federally-regulated milk prices are based in a globalizing industry. Regionally, dairies are also losing access to markets for their milk in the Northeast U.S. as consolidation at the dairy retail, processing and marketing levels continues at a rapid pace. (This hit an unprecedented level in 2018, though this was written in 2016). What can consumers do to support the agriculture and dairy farms that support their communities? 1) Thank a farmer, when you have the opportunity, and if you have questions about food and farming, don’t rely on ‘Google.’ Go to the source: Ask a farmer, visit a farm. 2) Buy local, whenever possible. Read labels, look at plant codes (check them out on whereismymilkfrom.com and @findmymilk on social media). Supporting local dairies is a sustainable step every consumer can take. Look for other label clues about milk origin, such as the PA Preferred label in Pennsylvania. To earn that label, the milk is not only bottled at a Pennsylvania plant, it must come from a Pennsylvania farm. 3) Realize that dairy milk is nature’s ultimate protein drink, containing up to eight times more protein per serving compared with plant-based beverages that falsely call themselves ‘milk.’ In addition, the amino acid quality of dairy protein is unsurpassed among the fraudulent beverages that steal milk’s good name. Dairy milk is also a natural source of calcium and other essential vitamins and minerals with no added sugar, thickeners or other additives found in those plant-based not-milk beverages. And the truth is known, that full-fat dairy is good for us! 4) Realize how the local economy depends on local dairy farms and how 97 percent of U.S. dairy farms, regardless of size, are owned and run by families. 5) Understand that farmers are passionate about the dairy life — caring for the land and animals but they also need to operate the farm as a business. For example, they adopt new technologies, just like other businesses, as they strive to navigate the devastating price cycles. If farms are not profitable, their ability to continue to the next generation — investing into the local economy, jobs, environmental stewardship, open-space beauty, and fresh food security benefits — can not continue here for the rest of us to enjoy. Will ‘local’ focus stem tide of milk displacement? BROWNSTOWN, Pa. — In the days following the “Save Pennsylvania Dairy Farms” town hall meeting in Lebanon March 19, some breakthroughs came for 9 of the 42 Pennsylvania farms notified by Dean Foods that their contracts will end May 31. Harrisburg Dairies, based in Harrisburg, picked up 5 (possibly 9) of the 26 farms let go by Dean’s Swiss Premium plant in Lebanon. Schneider’s Dairy, based in Pittsburgh, picked up 4 of the 16 farms let go by the Dean plant in Sharpsville. Both Harrisburg Dairies and Schneider’s Dairy source their milk through direct relationships with local family farms, and they use the PA Preferred logo on their milk labels, signifying it was produced and processed in Pennsylvania, which also means the state-mandated over-order premium paid by consumers is passed back through the supply chain. “It really made the decision for us, when it came to needing our milk supply to be independent producers that we can have a direct relationship, monitor and inspect ourselves,” Alex Dewey told abc27 News, Harrisburg about the PA Preferred label and their decision to add five of the displaced farms to their Pennsylvania-sourced milk. Dewey is the assistant general manager of Harrisburg Dairies. Both dairies appear to have chosen their 4 and 5 farms based on hauling routes and proximity to their respective plants. Meanwhile, the situation is in limbo the remaining 12 farms in western Pennsylvania, along with the handful of Ohio and New York producers, affected by volume adjustments at Sharpsville and New Wilmington as well as 21 in eastern Pennsylvania affected by volume adjustments at Dean’s Swiss plant in Lebanon. In addition, producers affected by these notices in Indiana, Kentucky, Tennessee and the Carolinas are also currently still seeking markets. A few in the Southeast have made plans to sell, but overall, there are still about 100 dairy farms displaced by Dean’s system-wide consolidation and Walmart’s new plant coming on line in May in Fort Wayne Indiana. Some other marketing factors are emerging. For example, the Dean Sharpsville plant continues to notoriously bring in loads of milk from Michigan. The company confirms that the 90-day notices sent Feb. 26 to over 100 dairy farms in 8 states, did not include Michigan. The Sharpsville plant was referenced specifically in the December Pennsylvania Milk Marketing Board (PMMB) hearing where the Pennsylvania Association of Milk Dealers and Dean Foods requested a significant reduction in the producer over-order premium to its lowest level in 17 years. This change to a 75-cent mandated premium went into effect for wholesale and retail milk price minimums January 1. At the time of the hearing, both John Pierce and Evan Kinser of Dean Foods testified that retailers are getting accustomed to bargain-priced milk elsewhere with documented retail milk prices offered to consumers in other states as low as 87 cents per gallon. Kinser testified that this new reality made Pennsylvania’s high state-minimum retail milk price an increasingly attractive destination for milk bottled elsewhere. Kinser had further testified that the pressure from the increasing influx of out-of-state milk was making it difficult for milk produced in Pennsylvania to compete for retail (and apparently farm level) contracts. Kinser also indicated that the mix of milk sourcing at the Sharpsville plant, in December, was already much different than the mix at the Swiss Premium plant in Lebanon. With Sharpsville close to the Ohio and New York borders, the plant has been sourcing milk from Ohio and New York for some time, but also increasingly from Michigan and Indiana. Kinser warned that if the premium were any higher than 75 cents, Dean Foods would be forced to renegotiate its contracts with suppliers to change the mix of milk used at ALL of its plants within the state in order to compete for contracts with packaged milk coming into the state from plants beyond Pennsylvania’s borders. Even though the PMMB granted Dean’s request to lower the mandated premium to 75 cents, it appears the mix of milk is being renegotiated anyway as part of the company’s milk supply chain consolidation process as the volume adjustments at Pennsylvania plants have fallen primarily onto Pennsylvania farms. Also emerging in the marketplace is the increased occurrence of brokered milk. This trend began in 2013 as producers across the Northeast and Mideast have dealt with contract losses in the fluid market at smaller levels than seen today. Great Lakes Milk Producers is an example of a recently organized group of producers from Ohio, Michigan and Indiana, which is organized “like” a cooperative but markets milk as single-source loads through a broker. Part of the drill is getting the milk qualified with farm audits and certifications as single-source loads that can be matched up to spot needs from cheese and yogurt plants to even, at times, the Dean plant in Sharpsville, Pennsylvania, the Southeast in the summer, and potentially even the new Class I Walmart plant in Fort Wayne. Marketing through a broker can mean a long haul in a long market with changing conditions. This option makes milk quality a mandate without a premium. As 27 farms in Indiana continue to seek a market, it is unclear whether brokering with Great Lakes Milk will become an option. The size of the displaced Indiana family dairy farms fits the single-source criteria, ranging 300 to 1500 cows and collectively represent an estimated 20 million pounds per month of displaced milk volume let go by a Dean plant in Indiana as well as Louisville, Kentucky. Among the recently affected Indiana farms is the sixth generation Kelsay Dairy Farm, operated by brothers Joe and Russ Kelsay and milking nearly 400 cows near Whiteland. Joe Kelsay was the milkman for last year’s Indy500. When asked if the new Walmart plant will pick up any of the Dean dropped farms, Leman said the plant’s supply has been locked up with a percentage coming from undisclosed dairies doing contracts directly with Walmart and the balance being single-source loads via third parties. Kelsay doesn’t blame either Dean or Walmart for the market loss his family and others are experiencing. “This is a difficult time, but we can’t fault one company or another for doing their best to run their businesses,” he said. Meanwhile, in Pennsylvania, town hall meetings were held (and reported in last week’s Farmshine) to raise public awareness. Ag Secretary Russ Redding wrote to Dean Foods asking for contract extensions. But Dean has indicated its problem with excess volume will begin before these contracts end. The timing is difficult with spring flush and spring decisions around the corner. “We’re all in limbo right now,” said Agri-King nutritionist Bob Byers in a phone interview. He works with 25 farms, serving in the affected area of western Pennsylvania for 20 years. He notes that affected farm families have only so much time to make decisions like what crops to plant, what fuel and supplies to order. These decisions revolve around whether or not they will be milking cows after May 31. Byers notes that this is the worst of times in the dairy business that he has seen in his 20 years and that it definitely affects local jobs and businesses. Alisha Risser of Lebanon posted this photo of Harrisburg Dairies’ milk displaying the PA Preferred label signifying the milk was produced on Pennsylvania farms. 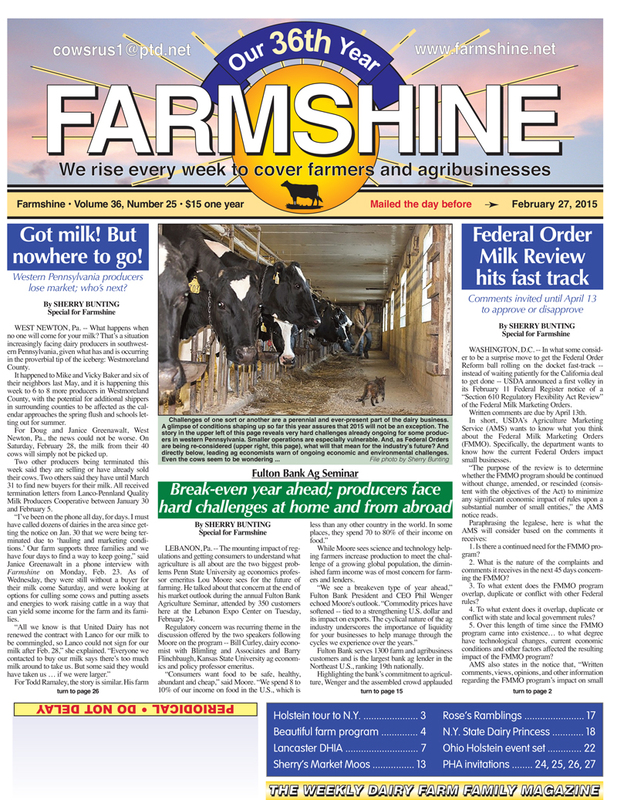 The Rissers were part of a town hall meeting in Lebanon reported in last week’s Farmshine, and they are one of five farms whose contracts were dropped by the Dean Swiss Premium plant in Lebanon that will be picked up by Harrisburg Dairies. LEBANON, Pa. – “Family is a treasure for all of us here, and we have a family crisis concerning our dairy farms,” said Randy Ebersole, a local car dealer whose family has been part of the Lebanon community surrounded by dairy farms for generations. He moderated a “Save Pennsylvania Dairy Farms” town hall meeting about the 26 Lebanon and Lancaster County dairy farms that received 90-day milk contract termination letters from the Lebanon Swiss Premium plant owned by Dean Foodd on March 3. The meeting drew 200 people to the Expo Center Monday (March 19) and was covered by three television stations and a host of other media. State representatives Frank Ryan, Russ Diamond and Sue Helm also attended and spoke about their commitment to work with farmers on solutions. Jayne Sebright, executive director of the Center for Dairy Excellence also attended, mentioning the Center’s resources for counseling and support as well as a joint venture with the Pennsylvania Dairymen’s Association to launch a “local and real milk” promotion by June Dairy Month. Pa. Ag Secretary Russell Redding was not present, but Sebright said he will be sending a letter to Dean Foods in support of an extension of terminated contracts for 42 Pennsylvania dairy farms, the 26 in eastern Pennsylvania and 16 shipping to Dean plants in western Pennsylvania. “This is the face of the dairy crisis. This is not fake news. This is real,” said Ebersole of the panel of three producers, a nutritionist, a veterinarian and a feed mill manager who shared their stories of the impact to the farms whose milk contracts will end May 31, 2018. This represents about half of the Lebanon plant’s daily milk intake. The message of the town hall meeting was simple: Don’t blame or boycott Dean Foods because there are still another 40 local farms who did not get letters and are supplying the Swiss plant in Lebanon. But do, write, call or email support for a contract extension for these terminated farms until fall or winter. And yes, drink more milk and eat more dairy products, especially locally-sourced dairy, knowing how it supports healthy bodies and healthy communities. All told, Dean Foods ended marketing agreements with over 100 farms in eight states as the company says it adjusted its milk volume because of a supply and demand imbalance made worse by the trend among retailers, namely Walmart, to vertically integrate into bottling their store brands and compressing the supply-chain with consolidated intakes and wider distributions. The emotional 2-hour meeting revealed community support for these farms by those who recognize how these farms touch many of its jobs and businesses. Yes. A legacy is on the line here. And there were plenty of youth among the 200 attendees, many of them from local dairy farms where the future is uncertain due to the current dairy economics and especially for those in the families whose farms have been blind-sided by these 90-day termination letters. One after another, people voiced their concern that 90 days is not enough time to find a new market at the worst time of year, ahead of spring flush, nor is it enough time for these families to unwind their businesses by selling cows, assets, even their farms and their homes to settle their lifetime investments in a way that allows these farm families to find a path forward. The parallels of this passage to what these farmers are facing were obvious in the emotion that followed as each of six panelists told their stories and as others attending lent their support and as 8-oz chugs of Dean’s TruMoo milk and trays of cheese from the Lebanon County dairy royalty were enjoyed. No one blamed Dean Foods. Producers talked of a good relationship with the plant. They talked of how the letters completely turned their worlds upside down. They talked of how they have called eight to 10 other milk buyers in the region, none of them stepping up to accept new milk. The affected producers and the businesses that serve them stressed that with a little more time, they could do what is best for their families. “Just like all the 26 farms affected in this community, our minds are missing right now,” said Alisha Risser. She and her husband have been shipping their milk to the Swiss plant for 17 years. She described how they worked full time jobs and saved and rented a barn before purchasing a herd and then building a dairy full time on their farm in 2001, when they began shipping milk to the plant in Lebanon. “We have been lucky to have our passion be our job every day and to share this with our kids,” said Risser, her voice tinged with emotion as she described how her husband and youngest son bounce ideas off each other about the cows and the crops. “Our children wonder what future we have now. This is such a feeling of helplessness. As milk pricing, promotion, regulatory environments and dietary guidelines are sorted out in the coming months, these farms are left without a milk market, without an opportunity to compete, to survive. “God is always faithful, and we know we will be okay in the end, but an extension would allow all 26 farms here to make decisions for our families and our futures,” Risser said. Indeed, a legacy is on the line in Lebanon and Lancaster Counties, as in other communities similarly affected. “I am not sure how we are going to handle this going forward. We have put all we have into the farm. Nothing will settle like it should,” said Brent Hostetter, who received his letter a week after the other farms on his milk hauling route were notified. Hostetter and his wife have been shipping to the plant for 19 years. “Our kids love the farm. It has been going three generations, and now I am not sure how we can see a fourth,” said Hostetter. Like the others, he said a contract extension would give them some time to figure things out. He also encouraged the public to “support our Pennsylvania farmers” to buy local milk and to look at the plant codes. Rick Stehr, a nutritionist and owner of R&J Consulting, directed some of his comments to the significant number of youth in the audience, saying that these farms are where the next generation learns morals, values, work ethic and the joys and failures of life. He noted that for every 9 milk cows in Pennsylvania, one job is supported in the related business infrastructure. In Lebanon County, alone, one job is supported by six cows. The impact is deep if these cows and farms are lost, he said. The emotion was palpable as Stehr and others offered to do whatever is needed in terms of counseling and assistance through this. Alan Graves, manager of Mark Hershey Farms, a prominent feed mill in Lebanon County, said 80% of the mill’s feed business is dairy. “We have been in business 45 years and employ 55 people in this community,” said Graves. “This day is about the producers and how they affect everything else in our communities. Our mill employees and their families rely on these dairies for their jobs. We don’t make business projections for 90 days, we are out a few years in our projections. Dr. Bruce Keck of Annville-Cleona Veterinary Service talked about how the public is unaware of what has been happening over the past 30 days and the past 10 years of consolidation and change. He asked the three television stations represented to raise awareness. “We want to bombard Dean Foods with letters and emails and phone calls,” he said. “These dairy farmers are so invested in cows and equipment that they can’t just quickly turn around,” said Keck, who has worked with local dairy farmers as a veterinarian for 25 years and took over the practice started by his father in 1961. He understands the family business dynamics. To communicate support for the farms facing 90-day termination of contracts, call Dean Foods at 214-303-3767, email dairydirectsupport@deanfoods.com, or mail a letter to Dean Foods, 2711 North Haskell Avenue, Suite 3400, Dallas, TX, 75204. Dumped. Desperate. Delivered. But is it over? FULTONVILLE, N.Y. — Ray Dykeman does not want to see anyone go through what he and his cooperative of 8 producers did this week. He cites the feeling of not knowing where to turn as the worst part of the “bizarre situation.” But as the group began their phone-tree of calls last week, and the Albany television news cameras rolled at the 950-cow Dykeman Dairy Farm to produce what became the number one ‘shared’ story of the week… things started happening that led to a reprieve. The co-op of 8 had lost their milk market. They were given notice 4 weeks ago that April 15 was the last day they would haul their milk to New York City’s only bottler — as they had for 13 years. Less milk was needed by Elmhurst Dairy, and another entity had stepped in to supply — and balance — that need. Dykeman served as the co-op’s point man communicating with other co-ops, processors, government officials and the media. The 8 farms, totaling near 3000 cows, were down to 7 days to find a new home for their 110 million pounds of annual milk. Staring them in the face was the real possibility of selling their cows and shutting their doors. “What do you do in 30 days, in that amount of time?” said Dykeman, who has ownership in 3 of the 8 affected farms, including the 500-cow Envision Dairy, Amsterdam, owned by a consortium of 23 people with expertise in different aspects of dairying and forage, along with young dairy startups from Cornell. Envision Dairy was accepted by another co-op 10 days before cutoff. That lightened the load a bit, but the rest of the milk was still a long way from home. But he had hope. Fellow dairy producers and community members were calling and emailing. People were reaching out. He had had countless meetings and secured two buyers to each take a little of the milk. On Tuesday afternoon, he was waiting for an answer from a third processor considering taking half. By late that evening, that contract was signed for a 3-month reprieve in time to make the nightly television news. “Trucking our milk to 3 different places will be new for us, but we are able to use the same hauler and we are accustomed to high trucking costs — having hauled milk into New York City for 13 years — so we are very happy,” said Dykeman with an audible sigh of relief. “I hope, going forward, we don’t let this experience go by the wayside because I honestly believe if we do not come up with a plan for this area, it will happen again and be potentially devastating,” he quickly added. “Just look at the investment farmers have. All that we have put at risk. “I would much rather have someone say to me: ‘We really need you to go out of business. You are not needed in New York anymore, and you have a year to get out,’ than to be told all of a sudden there’s no place to send my milk,” he said. Dykeman stressed that they have “no animosity toward any of the companies.” This is business to business, they realize. But what amazed them was the amount of public support. The 3-month reprieve gives the co-op of now 7 farms the breathing time to secure an annual contract. And Dykeman feels certain there will be more discussion in the industry on how to handle these things better in the future. One of the ideas being tossed around is to pair extra milk with efforts to supply food banks, or to ask the government how to use the “demand buying” in the Farm Bill to alleviate the supply pressure coming to roost on a region despite the fact that the “national average milk margin” is not even close yet to triggering the national government purchases for feeding programs. When reviewing the larger decline in Northeast Class I utilizations versus the decline nationally — and seeing the effect as Eastern mailbox milk prices fall further behind their respective all-milk price while national average mailbox milk prices have atypically become higher than the all-milk price — it is obvious that the Northeast market is the new squeeze-chute when milk supplies nationally burgeon. The yogurt-magnet that strengthened the confidence of Northeast dairy farmers over the past few years has led to small but steady increases in production, and then in 2014, New York increased by more than 2% to re-take from Idaho its former position as the #3 milk-producing state. Meanwhile the Northeast milkshed, as a whole, was up just under 2% in 2014 compared with the national increase of 2.7%, and has backed off in early 2015. Yogurt production is one of the primary fall-guys for the current supply/demand situation reversal of fortunes in the Northeast. But further analysis is less clear on that pointed finger. Yogurt production was 741 million pounds in New York State in 2013 and 692 million pounds in 2012. The 2014 figures for the state will not be available until late May. The 2012 and 2013 totals, however, show New York yogurt production used around 12% of New York’s growing milk supply in both years as both the yogurt and the milk production grew simultaneously. On a national basis, however, the total U.S. yogurt production figures are available at this time, and yogurt production grew from 4.42 billion pounds nationally in 2012 to 4.65 bil. lbs in 2013 to 4.74 bil. lbs. in 2014. Furthermore, the April 2 Dairy Products report indicated that nationwide plain and flavored fresh (not frozen) yogurt production was up in February by 7.2% over year ago and nearly 12% higher than for January. The yogurt industry is known to be highly secretive and competitive. Interestingly, 2009 is the last year in which the USDA reported monthly yogurt production on a state-by-state basis. Since 2010, those monthly yogurt production figures are only available on a national basis. This reporting change coincides with the timing of when yogurt production began to rise in New York State; so now, when it counts, there are no free and public records of production by state until 6 months after a year ends. It’s not that way for other substantial dairy products, and prior to 2010, those figures were available monthly without having to pay hundreds of dollars for an insider yogurt market publication to read insider industry estimates and trends. In April’s central New York situation, like western Pennsylvania in February, rumors fly about reasons for farms to be cut from the shipping rolls of processors and small co-ops. Some folks wonder about the milk quality of those producers, or they may believe producers were expecting to be paid more money. But that’s the thing with rumors, there is but a shred of quasi-truth. While some producers may find themselves in this situation through nitpicking on an inspection report or somatic cell counts that are a little too far north of 200,000, others may find themselves in this situation for merely asking a higher pay price when milk is short, but then staying with their processor on a handshake without the requested pay increase during the short-milk times only to find themselves on the other side of that equation — losing their processor when milk becomes long. The bottom line in talking to various folks who’ve been through this in Pennsylvania and New York, the common denominators are: 1) the lack of warning, 2) the inability to prepare or negotiate or help problem-solve in advance of being flatly cut off, and 3) the loss being driven, at least in part, by the independents and small co-ops’ lack of reliable access to balancing assets — either owned or simply a standby buyer that will take a little milk for cheese or butter or yogurt or powder as producers balance the diminished and diluted Class I demand. “Everyone in the industry was helpful to us, and we want to continue to work with them on solutions for the future,” said Dykeman reflectively. At the end of the day, from the outside looking in, it seems the good beef price and current status of processors wanting to label products rbST-free are two strong signals folks could pay attention to in stabilizing demand. It’s also important to gauge the market direction in planning phases of growth. That growth is necessary here to sustain the dairy infrastructure and make farms that are not quite as surrounded by other farms attractive as a pickup. However, the two market loss situations in Pennsylvania and New York illustrate vividly that size does not matter. As long as the Federal Orders put all the marbles of high value, pooling and provisions into Class I while that is the milk class that is dwindling in sales, size won’t matter. When milk is long, the milk guns will continue to point East and all size farms are vulnerable in the business of dealing with the push of supply through the squeeze chute. Look for more on the Northeast market situation in next week’s Farmshine. WEST NEWTON, Pa. — What happens when no one will come for your milk? That’s a situation increasingly facing dairy producers in southwest Pennsylvania, given what has and is occurring in the proverbial tip of the iceberg: Westmoreland County. It happened to Mike and Vicky Baker and six of their neighbors last May, and it is happening this week to 6 to 8 more producers in Westmoreland County, with the potential for additional shippers in surrounding counties to be affected as the calendar approaches the spring flush and schools letting out for summer. For Doug and Janice Greenawalt, West Newton, Pa., the news could not be worse. On Saturday, February 28, the milk from their 40 cows will simply not be picked up. Two other producers being terminated this week said they are selling or have already sold their cows. Two others said they have until March 31 to find new buyers for their milk. All received termination letters from Lanco-Pennland Quality Milk Producers Cooperative between January 30 and February 5. “I’ve been on the phone all day, for days. 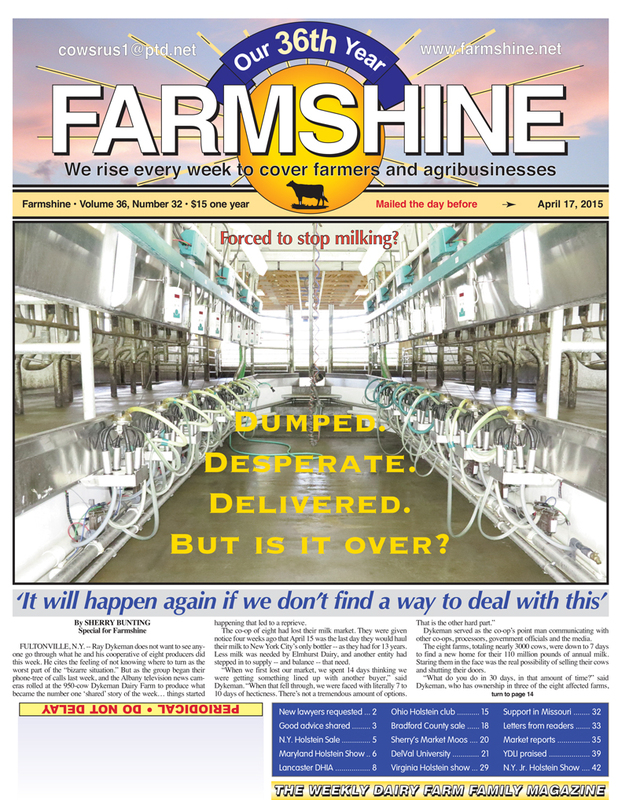 I must have called dozens of dairies in the area since getting the notice on Jan. 30 that we were being terminated due to ‘hauling and marketing conditions.’ Our farm supports 3 families and we have 4 days to find a way to keep going,” said Janice Greenawalt in a phone interview with Farmshine Monday. As of Wednesday, they were still without a buyer for their milk come Saturday, and were looking at options for culling some cows and putting assets and energies to work raising cattle in a way that can yield some income for the farm and its families. If his milk went to DFA, it would actually still go, physically, to the United Dairy, Inc. plant in Uniontown, several sources indicated, because United has a “swapping deal” with DFA, under which some of United’s milk goes to DFA’s plant in New Wilmington and some of DFA’s milk goes to United’s Uniontown plant. When asked about the letters sent to six of its producers in Pennsylvania’s southwest corner, Lanco’s director of dairy operations Robert Morris explained how originally all the milk hauled by that hauler served Saputo Cheese in Hancock, Maryland. According to Morris, United had apprised Lanco about losing a sizeable bottling contract through its system in January, and before cutting its own producers, would first stop receiving milk from outside sources. United set Feb. 28 as the last day they could commingle that milk. Lanco also received word through the St. Louis, Missouri milk broker that ran the commingling that United’s sizeable loss of sales would prohibit further commingling of Lanco milk in that region on their trucks. Morris noted that Lanco is “still taking on new producers in areas where we have haulers close to our customer base,” and he noted the six producers they’ve let go are “small farms and out of our orbit, especially since Saputo closed the Hancock plant in July. Requests from the affected producers to find a way to haul their milk for Lanco were denied. Morris further explained that their milk from south of Williamsport, including Cambria County, Indiana County and Somerset County as well as Garrett County, Maryland — that had all flowed to Saputo in Hancock — is now going East to the Land O’Lakes plant in Carlisle. Some of it goes to Dairy Maid in Frederick, Md., and to HP Hood in Winchester, Va. In areas where Lanco has hauling, they do commingle with the Maryland/Virginia co-op, but these fringe areas — like Westmoreland County — are an issue now without the Saputo cheese plant and considering the cut in volume needed by United at its Uniontown plant. Both Lanco and Maryland/Virginia have milk into Somerset County, plus Maryland/Virginia has milk in the Sugarcreek, Ohio region. The producers affected by the latest termination fall into a void — a pocket of milk between two higher-density dairy areas. “They did some redistricting with their stores, and that milk volume is now going to other warehouses,” he noted. This would include the warehouses served by United’s bottling plants in Ohio and West Virginia. McCombs said the loss of volume going to the Save-A-Lot warehouse served by United’s Uniontown, Pa. plant leaves the company with the difficult task of deciding when and how to cut some of its own independent shippers that serve that plant as well. According to McCombs, United’s current 340 farms produce 36 million pounds of milk per month, and this total had increased by 850,000 pounds from December to January. “Our farms have not added cows, but they are producing a lot more milk per cow. It must be the good feed,” he said. The Pennsylvania Department of Agriculture has received the quality records of the terminated farms, but not one of the producers has heard anything in terms of options from the state. For shippers in Federal Orders 1 or 33, there are provisions for the market administrator to direct a cooperative to pick up the milk but be allowed to pass the full cost of marketing on to the producers. However, the shippers regulated under the Pa. Milk Marketing Board do not have those protections if their Class I market collapses. That is what happened to Mike and Vicky Baker’s dairy and six others in the Westmoreland County region last May. “We have a lot of independent processors in this western region,” she said in a phone interview Tuesday. She recounted her experience of losing their milk market last spring. In fact, her dairy and the others let go at that time were in the top seven for milk quality at the plant, and they lost their market anyway. “We were able to get a good load of milk together at that time, so five of us are now with Land O’Lakes. It’s not cheap. We are paying $1.43/cwt in trucking costs,” she said. The overarching problem, says Morris at Lanco, is that the Northeast and Mid-Atlantic market is “losing raw silo space” for weekends, holidays, and times of the year when Class I utilization is lowest. Add to this the 4% national decline in Class I sales to begin with, along with the reluctance of cheese plants to run at full capacity to build inventory, and the situation becomes one that producers throughout the region should be watching. While some truckers report wait times at plants of 2 and 4 hours over the holidays, coop dispatchers note that was accomplished by dumping milk or just separating the cream and dumping the skim so that the trucks would not be waiting and so their turnaround times could be maximized on multiple routes. Estimates of milk dumpage since last summer runs in the hundreds, but is anyone’s guess. DFA’s response to the question is to say it balances its member milk as it sees fit. Only certain types of milk dumping are reported to the Market Administrator, and that’s a story for another day. For Todd Frescura, another of the six Lanco-terminated producers, the path forward will be different. He has talked with Horizon because there is demand for Organic milk that is reportedly in short supply. He is confident his fields will certify for three years of organic treatment due to the way his farm is operated for rotational grazing. But he will still have to wait one year for the herd to be certified. “I guess I’ll cull the herd real hard, dry the cows I can, and maybe just milk 10 cows to feed calves for the neighbors and raise my heifers to be ready to produce organic milk in the future,” said Frescura. But “going organic” is not an easy answer for most of the dairies affected now and in the future. With the milk dumping last spring and summer and over the holidays, the concern is the independent bottlers will have a balancing problem once the spring flush hits and the schools let out in June. Part of the problem is the reportedly large shipments of milk into Pennsylvania balancing plants from Michigan. DFA member-milk from Michigan takes precedence over non-coop milk, here, and DFA’s plants are full to the point where the cooperative is charging a 50-cent/cwt marketing fee. Land O’Lake’s fee also increased recently from 15 to 40 cents/cwt. What will happen to the shippers for plants that are relying on 60 to 80% of their market in Class I? The verbal agreements bottlers have with DFA may not be good enough to carry their shippers through the loss of fluid sales at a time when balancing plants are full, production per cow is high and the schools are closed. Baker notes that the annual Southwest Regional Dairy Days in Blairsville, Pa. next Thursday, March 5 will include a producer panel on this topic. My great grandmother grew up milking cows in East Berlin, Adams County, Pennsylvania, not far from the battle of Gettysburg. She loved to cook. She always smiled. She was seldom cross, but you knew she meant business when she said: “Now, mind!” She was practical and daring. She wore pants before it was fashionable for ladies to do so and pierced her ears when the younger generations were still wearing clip-ons. Growing up, I heard Sadie Phillips say more than once: “Trust your gut and Be bold!” Today, I have decided to do just that. I am using my blog to carry the public comments I will submit to USDA on the due date Monday, April 13 regarding the FEDERAL MILK MARKETING ORDERS and how they are (or are not) fulfilling their purpose and the effect on small businesses (A Section 610 Review). I’ll get knocked around for this in some circles, I am quite sure. And this is certainly very long for anyone to read. But here it is. Have at it. Or, if you are so inclined after reading it, shoot me a message, note, or thumbs up if you want your name added before I submit officially to USDA on Monday. As a freelance ag journalist and market reporter for the past 30-plus years — as well as having as clients multiple small businesses and dairy farmer organizations for whom I do writing and photography — I get around the country and see firsthand what is happening to milk movement and dairy markets and the effects on dairy farm small businesses — as well as the small businesses that serve the dairy farms and the combination of jobs and revenue they provide to sustain rural economies. Small businesses in the dairy industry — from the farm, to the service and supplies, to the processing, to the retailing — are in trouble. National Big-Business retailers and processors as well as national Big-Business cooperatives employ stables of milk accountants, attorneys and others in a centralized management model to re-shape the grid of milk movement within and between Federal Milk Marketing Orders (FMMO). Why would any small-business want to innovate in the fluid milk category when the two national Big-Business cooperatives (who work together through regional “marketing arms”) can come in and swoop the earnings away using FMMO rules to do so? Yes, it has become increasingly difficult for the Northeast and Southeast milksheds to hold on to their Class I utilization in their respective blend prices. It is becoming more difficult to supply local milk beverage needs with a local supply of farm milk as the FMMO program of marketwide pooling actually facilitates the move to centralized models that displace milk from the local small businesses, local farms, local communities. In effect, national Big-Business cooperatives are locking up regional balancing assets. By owning or controlling with full supply contracts most, if not all, of the dairy manufacturing in a region, independent bottlers and small co-ops find fewer options for selling extra loads to self-balance their local-to-local fluid market. As a result, we are seeing individuals and small co-ops lose longstanding contracts with local bottlers in pockets all over the Northeast — especially in western Pennsylvania and central New York. In some cases, farms have been forced to sell their cows because they are now without a market at all. These devastating effects have played out in other regions where small co-ops lost their markets to the Big-Business bottler and national Big-Business cooperative, and now this same effect is playing out in the Northeast — this time facilitated in part by complex FMMO rules. The current FMMOs provide a needed structure and accountability in the buying and selling of milk. They also have the purpose of stabilizing prices through marketwide pooling. But opinions and analyses differ on whether the classification system — as it exists today — is stabilizing or instead contributes to price volatility. It also seems to detract from a competitive value being paid for manufacturing milk. These 3 purposes (above) are not being realized in the current FMMO system. A signal of DIS-orderly marketing is the fact that dairy farms within the Eastern markets are losing their access to milk marketing. Milk produced in Georgia — that used to go to Florida — is moving North, while milk from Texas moves into Florida. Milk in Pennsylvania and New York is being displaced from its own milkshed by milk from Michigan. Milk from Illinois moves into Order 5 while milk from Kentucky has recently been trucked all the way to Texas, and vice versa. Truckers talk (more than tongue-in-cheek) about loads passing each other on the highways. Both the Northeast and the Southeast are being chastised for having dared to increase their production. Farmers in Pennsylvania and New York are blamed for creating their own bottlenecks of surplus milk forcing tankerloads of milk to be dumped. Those ‘bad boy’ Eastern producers should not be growing their dairies. After all, that growth is throwing a monkey wrench into the planning of other regions to grow rapidly with eyes on filling the Eastern milk market deficit, using Class 1 sales in the East to sweeten the blend price paid to dairies that locate or relocate near huge dairy manufacturing plants in the West so those plants can enjoy the cheaper price paid for the milk they use to make dairy products. The fight is on for the shrinking Class I piece of the milk market pie, when in reality other manufacturing uses have more value! In the process, consumers pay MORE for their beverage milk and farmers receive LESS. Farmers receive a shrinking percentage of the consumer retail dollar and a shrinking percentage of Class 1 sales. And yet…. the milk is all the same standard whether it goes in a bottle, in a cheese vat, a butter churn or a yogurt process. It’s all the same quality grade of milk! As for current milk production growth. The truth is that the Northeast milkshed and the Southeast milkshed are not out-growing the needs of their areas. They are located in close proximity to consumer population growth, and their own milk production growth reflects an attempt to merely gain back some of their own formerly lost production that has weakened their infrastructure over the past 14 years for the farms that remain. The Northeast milkshed and the Southeast milkshed are both deficit if just the milk within their borders is considered. My home state of Pennsylvania, for example, has lost 55,000 cows since 2002 and 100 million pounds of production. Furthermore, leaders of states in the Northeast and Southeast milksheds — Pennsylvania, New York, Georgia, Kentucky for example — have implemented programs and incentives aimed at GROWING their respective states’ dairy small businesses. Now, the very dairy farms these incentives were implemented to uphold are cast aside as the milk is displaced from elsewhere. 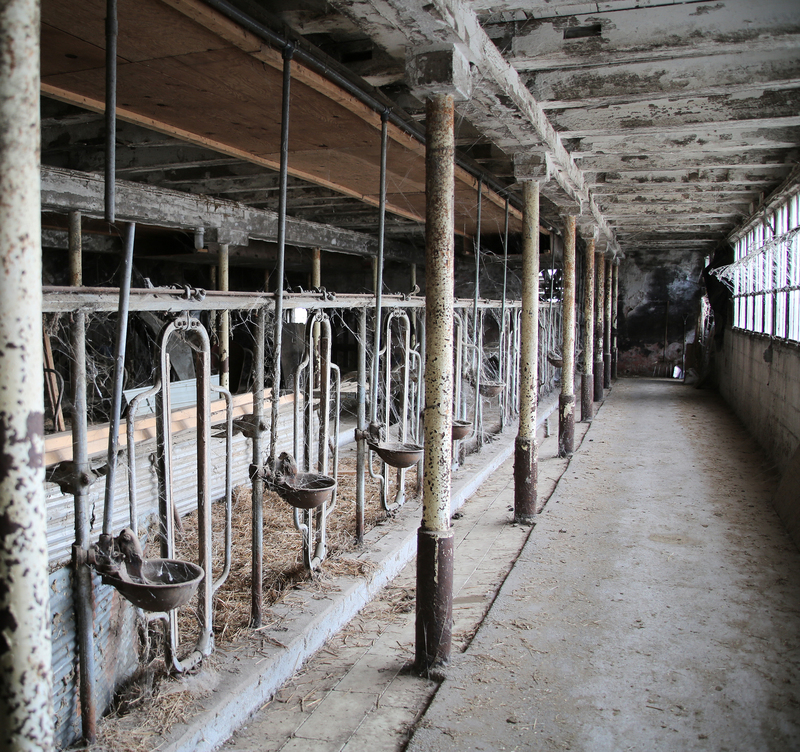 The implementation of the Federal Orders has become short-sighted in the quest to simply “Assure an adequate supply of milk to consumers.” But what about the future when the small-business farms and infrastructure here in the East are so diminished they implode? And look at the cost! Fluid milk consumption is down and we keep jacking up the price with all of these maneuverings. Maybe if a more localized model was respected and c onsidered, farmers and consumers would both benefit. The purpose of the Federal Orders needs to be more considerate of the long term. It should not be declaring the winners and losers, but instead provide a level playing field where the real costs of transportation are factored into the value of local milk to local markets. The large and powerful market movers take over the grid and push regional suppliers — mainly small businesses that are central to their own communities — to the side. These entities bring milk into the community and then drain local dollars out of the community. As a result, small dairy businesses are going out of business at an alarming rate. Independent dairy farmers, small and mid-sized, as well as small cooperatives, are getting notices that they are being dropped by local bottlers in my home state of Pennsylvania and north into New York and in Ohio. Young Plain-Sect farmers are finding out in the Southeast they can’t just start milking cows like their fathers did before them. There is no market, they are told, even though the Southeast is a milk deficit area. The Northeast is as well. The small regional bottlers are being squeezed by the large national co-ops who own or control the balancing assets (through both ownership and contracts) within the Northeast, and Southeast. So, when milk from members of the national Big-Business co-op is produced in the rapid (double-digit) growth areas of Michigan and Texas, for example, that milk takes precedence at the national co-op-owned and controlled balancing assets in the Northeast and Southeast — effectively pushing the local small business independent shippers and small regional co-ops out of the bottling plants and into situations where they don’t have a market for their milk. The Walmartization of food retailing has infiltrated its way to the farm-level because local small businesses have limited access to the dairy product processing plants where they once sold extra loads at a discount in order to balance the fluctuations of the fluid milk market. The set make allowance that is built into the manufacturing class milk prices also encourages large single-product plants versus a market-savvy and nimble processing class that makes for the market. In Pennsylvania, some bottlers are working together with local food banks to balance the ups and downs of the fluid market so they can keep their longtime shippers instead of giving them up to the national Big-Business co-ops who in turn broker the milk back to the plants it went to in the first place. What do the Federal Orders bring to this mix or — should I say — mess? First, It is currently too easy to move milk and get paid more for moving it the farthest! As a result, dairy manufacturing plants are being built where there are not many cows. “If you build it, they will come.” But then they will also send their milk back East to get that juicy Class I utilization to boost their blend price and keep the cost of milk down for the large new manufacturing plants. The small businesses of the eastern region need a method by which to have the local-ness of their milk count for something in this equation!! If the government is going to be so involved, then it needs to look at the big picture. Currently, not enough incentive is built into the FMMO structure to give local-supply-arrangements and advantage in the fresh fluid milk beverage market based on the fact that milk flows in smaller circles and does not have to move so far. While I am not an expert on how all of the pieces of the FMMO came to be, I do know that some of the fixes have created new and worsening problems. 1) Please extend the comment period to allow for more time to comment. Dairy producers are waking up to some disturbing activity in the Eastern markets. More is becoming known about the current failures of the Federal Orders to uphold their intended purpose! Dairy farms — in increments of half-dozen to a dozen at a time — are getting notices RIGHT NOW that they must find another market or sell out their cows, their investment, their vocation, their family-living, their heritage. More and more of these producers losing their markets are the highest quality milk producers! Their only fault is they are small businesses (40 to 1000 cows) or part of a small co-op (8 to 12 producers). A large iron fist is coming down in the eastern markets and blaming the bloodbath of farms forced to shut down, dump milk, and go out of business on “too much milk” in the East. All the while, milk from Michigan in the north and Texas in the south is displacing local eastern milk in the balancing assets of the two large national-and-centralized co-ops that work together. Members first, locals last. 2) Before considering the addition of California to the current FMMO system, please hold national hearings to first evaluate and devise a new pricing formula. Consider basing it on 2-classes of milk: fluid and manufacturing as well as component values based on an array of products — and evaluate removal of the “set” make allowance. This could facilitate competition among various entities buying milk for a variety of manufacturing uses — instead of declaring the winners and losers via set make allowances that encourage large single-product plants that are not nimble nor responsive to changing market conditions. This could also cut down on some of the gaming we see among balancing assets and lead to more actual marketing of dairy milk products rather than large output of products the market may or may not want because the set make-allowance assures a margin where pure scale is the key to profit and efficiency. An example of this is the difference between skim milk powder – a uniform product with a standardized protein content – vs. nonfat dry milk (on which the make allowance for powder is based) which is a lower quality product and not uniform in that the protein percentage falls into a 4-point range. If the market wants SMP for its repeatability in a recipe but the make allowance is based on NFDM, the response in a downtrending market is to make more of the latter because the margin is guaranteed by a set make allowance, which further depresses the market. 3) Re-evaluate the purpose, relationship and actual function of transportation credits, touch-base provisions, diversions and other aspects of how milk is supplied so that a premium resides wherever local milk supplies local markets and wherever the regional infrastructure of dairy farms and businesses is upheld in the movement of milk within a Federal Order. Perhaps instead of using such credits and rules to facilitate the bringing of milk from far away, the fund would be better used to get local milk to local markets. Local small businesses are being forced out of business rapidly. The Department needs to move quickly to establish a fund where processors pay in what would have been spent to bring the distant milk so those dollars are used in the local community or within the Order to offset the balancing cost of keeping local dairy farms on the rolls. In short, perhaps it is time to use the Federal Orders for their intended purpose and break up the centralized stranglehold of the two national Big-Business cooperatives working together (even sharing attorney and milk accountant assets) by forcing them to stop painting their milk movements with a centralized broad brush – forcing them to more aptly consider local to local, regional to regional. It is also worth mentioning here that some shifts in the gap between the USDA “all-milk” price and the “mailbox” price released months later are becoming apparent as the national mailbox price has been higher than the all-milk price while the Southeast, Appalachia, Pennsylvania, and New York mailbox prices are falling further and further behind the all-milk price than ever before. This may have something to do with the 6% reduction in Class I utilization in the Southeast in 2014 and the 4% reduction in Class I utilization in the Northeast in 2014. The national reduction in Class I utilization is 3% by comparison. This reflects not only the raw milk movement but also the infiltration of packaged milk coming from outside of the Northeast and Southeast milksheds directly onto the shelves of large buyers like Costco and Walmart. Some are calling for the abolition of the “archaic Federal Orders.” I would be on that bandwagon in a heartbeat — favoring open markets over the continued use and misuse of rules and structure to supress a region’s own supply of dairy farms, small businesses and infrastructure — if I didn’t think the Federal Orders still have a purpose of accountability and to be a running record for what is happening. However, if the current problems are not fixed to give local milk, supplied by small businesses a fighting chance, then perhaps the FMMO system should go. We have seen the loss of too many small business in the dairy industry where nationalized Big Business processors and co-ops used FMMO rules to their advantage to take over markets. Without a change in FMMO rules, this will continue and accelerate, and we will see more losses of small dairy businesses that sustain rural communities. If the current problems are not fixed, small businesses may find they are better off in a totally free market, unencumbered by the structure and rules that are increasingly designed by the national Big Business operators to effectively put them out of business as they increase their own centralized national footprint. Please do not add California until after the current issues with the FMMOs are fixed to a point where local is rewarded in the formula and small business is respected. Once California is added, it will be much harder to make new changes that benefit local small businesses fighting for survival in the East. Thus, the current areas controlled by FMMOs should have a chance to improve the rules before adding the state that has wanted to be state-regulated for decades and represents almost one-fourth of the total milk production in the U.S.